One war. Too many battles. In Jennifer A. Nielsen’s The Shadow Throne, war has come to Carthya, knocking at every door and window throughout the land. And when Jaron learns that King Vargan of Avenia has kidnapped Imogen in order to bring Carthya to its knees, he knows it’s completely up to him to embark on a rescue mission. If only everything wasn’t going wrong already. As the battle rages on, Jaron’s friends are sent out throughout Carthya and its neighbouring lands. In a last-ditch effort to stave off a possibly devastating loss for the kingdom, King Jaron embarks on a journey to save everything and everyone he loves. However, his lightening-quick wit may not be fast enough to forestall the imminent danger that Carthya is facing? And if it isn’t, then who will sit on Carthya’s throne? As with The False Prince and The Runaway King – the first two novels in the Ascendance Trilogy – The Shadow King is an explosively good novel for older MG and younger YA readers (10-14). Of course, I’m an adult reader, and I not only enjoyed the twists and turns of the first two books, but also felt that Nielsen does a great job of making the stakes even higher than they were before while still dishing out a decent number of humorous moments and a lot of heart. The Shadow Throne begins three weeks earlier than the closing moments of the previous novel during a very public argument between Jaron and Roden about strategies to train the military. After showing that the Carthya army has been divided, Nielsen quickly returns Jaron (and the reader) to the moment when Kerwyn, Amarinda, and Mott inform him not only that Avenia, Gelyn, and Mendenwal are advancing on the Kingdom of Carthya, but also that Libeth was destroyed and Imogen was taken prisoner by Avenia. War is upon them, and Jaron has a lot of strategizing to do before the novel’s inevitable conclusion. Even though readers have seen Jaron overcome a difficult situation in The False Prince and impossible ones in The Runaway King, the final book in The Ascendance Trilogy will have the reader wondering whether his good luck will run out now that both his country and army are woefully overpowered from all sides? Readers interested in the themes of friendship, love, father-son relationships, trust, bravery, bargains, betrayal, war and/or what it would take for characters to divulge state secrets to their enemies will get a lot out of various aspects of this novel. While the main characters of this series have always been men, both male and female readers will notice that not only are Amarinda and Imogen – the series’ central female characters – shown to be strong, capable, and willing to risk everything for their country, even their lives if necessary, but also Nielsen shows that even the minor female characters are just as committed to preserving their country and sometimes their efforts are key to victory in the war. Even better, the author makes a point of having Jaron, Mott, and Tobias regularly recognize the female characters’ accomplishments of these female characters through the dialog both directly to them and amongst themselves, which is not something you see everyday. Several funny moments occur in The Shadow Throne just as they existed in the previous novels in the trilogy, but there seems to be fewer of them in the beginning half of this novel. Roden is the captain of the guard, but early on he has neither any control of nor any respect from his men, which leads to a loss of many lives in Carthya’s army. Several key deaths also dampen the mood of the book and of Jaron, understandably so. Nevertheless, the more involved Jaron is in the war, the more likely he’ll use humour to connect him with readers. From the old to the new characters, you’ll love them…and The Shadow Throne…guaranteed, even if some of the plot twists that are revealed in the last 5-10 chapters are pretty obvious. There will, nevertheless, be some other surprises that you’ll never see coming; you wouldn’t (and shouldn’t) expect anything less from a novel with Jaron as the central character, right? 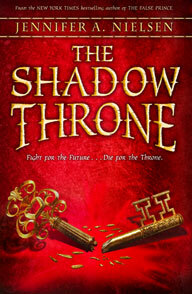 Buy The Shadow Throne today and benefit from 21% off the regular price! You’re right about appreciating those themes. I love when an author invests time and good writing on introducing and developing universals like these. Kids need to need to read about them. So true, C. Lee! Thanks for reading my review.